Large studio suitable for four persons – stylish, fresh decor and functional floor plan. There is an alcove with two 80-90 cm single beds side by side. The living room sofa also opens up to addition bed. The alcove opening is with curtains for easy darkening and privacy. The 4-seat-dining table allows you to have friends over for dinner. You will also find a TV set, fully equipped open-plan kitchen and stylish shower room. There is no washing machine, but you can do your washing in the laundry room you will find on Floor 0, Door A. 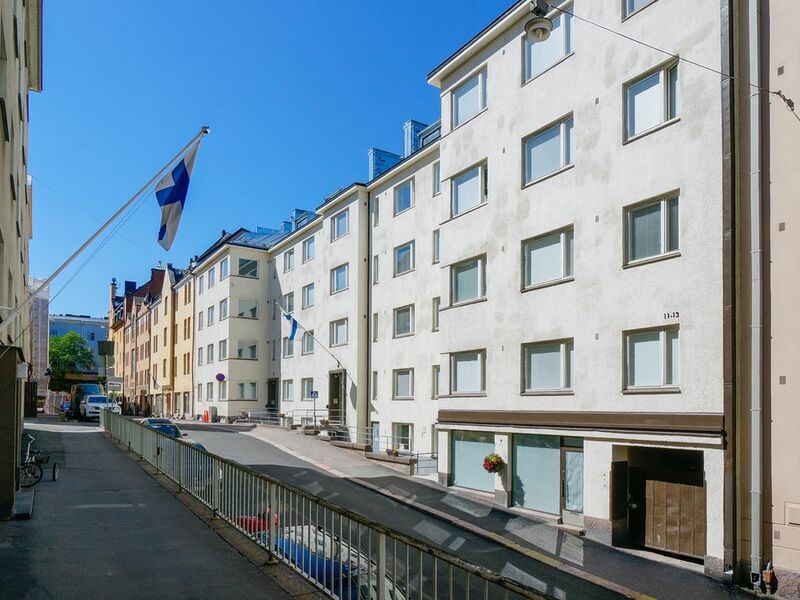 This block of apartments is located in Kruununhaka region, one of the most respected areas in Helsinki. From peaceful Kruununhaka it is walking distance to Hakaniemi, urban and famous Kallio, Töölönlahti bay, University of Helsinki´s main buildings and many must-see-sights. Area has great services and recreational areas nearby – and public transportation is excellent wherever you are headed. The apartment is fully furnished and you can find dishes in the kitchen so that you can have breakfast and prepare dinner. Services to help your day-to-day life (for example, cleaning services) are also available to the apartment. After booking, you will receive payment instructions and a payment link from the property via email. Credit cards are only needed to guarantee your booking. This apartment has key code locks. The code will be sent to you by SMS and email by 16:00 pm on the day your reservation begins. Enter the five-digit code followed by hash on the keypad on the door, for example 12345#. If you enter the wrong code, press the # key again before re-entering your code.